"Selling a childhood home after your parent has passed away is a difficult chore that many must face. It becomes further complicated if you live out of state and cannot easily travel to the property location to iron out details. I chose Mimi Noyes Burke because she is very familiar with the Barrington property market, she is tremendously patient, and she is professional. All questions were answered promptly, she coordinated last-minute closing tasks efficiently, and throughout the process, she remained sensitive to the circumstances surrounding the need to sell the home. All in all, Mimi helped make a highly emotional decision proceed very smoothly. I would happily recommend Mimi if you are contemplating a home sale in the Barrington area." "As forty year residents of Barrington we could not recommend Mimi more highly for your real estate needs. Whether purchasing or selling, one needs to go to a proven agent with excellent credentials and that person would be Mimi Burke. Being a lifelong Barringtonian, she knows the neighborhoods, the residents (many of whom she found their homes) and conducts herself in the most professional yet personal manner and helps alleviate any possible stress from a move either local or long distance. She provides daily updates on properties and is always immediately available when needed, either by phone or in person." - Mr. & Mrs. John W.
"When contemplating a relocation from Baltimore back to my home town of Barrington, I thought of Mimi due to our long-standing relationship dating back to our days growing up in North Barrington. She was immediately on the hunt and was a pleasure in which for my wife Carri to work. Knowing the Barrington area was helpful for me, but Mimi’s knowledge of the market, the process, and willingness to express her options based on our relationship was invaluable. She was able to connect with my wife and quickly and clearly understood the type of property in which we were interested. Once a property had been identified, she was aggressive in assisting in our negotiation and made certain we paid a fair and equitable price. Our closing was uneventful do Mimi’s preparation work. If anyone is interested in property in the area, Mimi’s long standing commitment to the community and the real estate transactions will help put you at ease and make the process enjoyable and effective." - Mr. & Mrs. Mike & Carri N.
"Mimi Noyes is uncommonly talented, savvy, and extremely bright. She brims with energy and works with a passion for her clients. She knows the real estate market & the industry as good as it gets! After 35 years of my corporate meandering across 12 states, buying/selling 15 homes, Mimi is by far the best of the best!" "Mimi Noyes Burke earned our highest praise and gratitude for all she did to sell our parents' house in 2014. It was long distance for us and her extensive knowledge of the Barrington area, the real estate market, local regulations, and tradespeople was invaluable. Mimi's practical willingness to step in to help went above and beyond what was expected. She was always confident and professional and gave wise, honest and realistic advice. Mimi skillfully dealt with many unforeseen complications while readying the house for sale, during negotiations and with details at settlement. We never had to worry. We felt comfortable taking her well considered advice. She was organized, available and never failed to return a call or keep us informed as things progressed. It was a pleasure to work with Mimi Noyes Burke and we give her our sincere and best recommendation." - Ms. Katy C. & Mr. Carl K.
"Mimi Burke is a true professional. Her judgment is excellent and her marketing is superb. From providing invaluable advice about staging the house, to refusing to accept a contingent offer until the buyer's home was on contract, she was absolutely correct. At the same time, she accommodated some deviation from her professional judgment which allowed a smart partnership. I have the highest respect for her, trust her well honed skills, and am certain your property will be shown in its best light with Mimi's representation." "Working with Mimi Burke to sell our home was a smooth process with an excellent result. In a difficult real estate market, she worked hard to make the deal happen and to everyone's satisfaction. We chose Mimi as our realtor for her thoughtful advice and counsel, her experience in real estate, and her in depth knowledge of the Barrington area market. She was generous in her personal attention to our needs, and in addition she employs a staff of highly competent professionals who created unique and eye catching marketing tools. Together, she and her team implemented a plan which gave us a quick and successful outcome. It was a pleasure working with Mimi." "As first time home buyers and needing to sell our condo quickly, we asked Mimi to help. Mimi was right over the next day to take a look at the condo and to advise us of little things we could do to improve the place. We quickly got it on the market, thanks to Mimi, and got a great offer a few days later. As the offer was time sensitive, Mimi worked quickly and had made a deal the same morning and our condo was sold! With the condo sold, we focused on house hunting. Mimi found some great houses, but was sure to point out if something was missing from the house that we had said we wanted. Mimi was incredibly patient with us [we were a little picky :)] and we never felt any pressure while looking at homes. Mimi always made herself available to us if we saw a home online and wanted to look at it that day. Despite how picky we were, we found the home of our dreams fairly quickly. Unfortunately for us, quite a few other people wanted this home as well. I thought there was no way we would "win the bidding war," but thanks to Mimi's excellent advice and negotiating skills, we got the home of our dreams and we couldn't be happier. Mimi made the whole process so easy for us and she made understanding all the paperwork and real estate jargon very simple for us as well. She's simply the best around and you will not regret working with her! I cannot say enough about how fantastic she is!!" - Mr. & Mrs. Dustin & Kelly E.
"Every so often in life, you come across with awesome individuals you treasure. We did not know Mimi at all, but realized Mimi is one of those individuals. She is of course professional and yet also personal. As a local resident for a long time, her knowledge about the community as well as the professional expertise are invaluable. But most importantly, she treated our transition as an experience not a transaction. She definitely went above and beyond, out of her way to make us feel as though we are the only client she is working with. She is a real estate agent extraordinaire and we recommend her without any reservation what so ever." - Mr. & Mrs. Rolland & Jessica S.
"Mimi was the listing agent on several homes we toured when we were looking to move. The way she presented each home impressed us so much we felt she would be the best to sell our home. Mimi has an amazing way of getting things done. We had several last minute issues prior to closing on our home and she was able to get people out to our house the same day to get the jobs done. She knows someone for every job that could possibly be done in a home. I think she carries around a magic wand! Mimi is professional, ethical, and can get the job done. She sells homes because she understands people's emotions and can work through difficult decisions and situations. She was always available to talk to and responded with solutions immediately. I would work with her again in a heartbeat. Thanks Mimi!" - Mr. & Mrs. Bryan & Jessica B. "Mimi spent almost two years advertising our home which cost money. She had sound & helpful advice over this period." - Mr. & Mrs. Cash & Dorie M.
"We have enjoyed working with Mimi on buying and selling several homes. Her quiet elegance belies a great knowledge of the Barrington market, as well as expertise as a negotiator and businesswoman. Despite her status as one of the premier realtors in the area, we have always found Mimi to be responsive and interested in our pursuits. Mimi's tough when she needs to be, yet has a pleasant, easygoing demeanor that makes doing business with her a pleasure. We trust her advice and judgment on real estate investments." - Mr. & Mrs. Bob & Mindy V.
"I wanted to drop you a note to share with you how pleased I am with both you and your staff’s handling the sale of my home. You were always available or prompt to follow up with me. I understand my property was in rough condition. The prior broker had it listed for 7 months. You achieved more traffic in the first 14 days then he had in 7 months. You presented two contracts within 30 days. Fortunately your experience was proven in the manner in which you protected me contractually as the inspection report presented a substantial list of issues. I felt you achieved a fair value and your professionalism and integrity are greatly appreciated. You provided exceptional value and exceeded my expectations." "We selected Mimi as our agent when we chose to sell our house. We chose Mimi based on her unmatched knowledge of the Barrington area and recommendations from friends and colleagues who raved about her professionalism. Our experience in working with Mimi exceeded our expectations. Mimi was so professional, and her communication with us throughout the process of selling our home was excellent. Mimi’s extensive network with other agents in the area was helpful in creating awareness about our property. We would highly recommend Mimi to our friends, whether they are looking to buy or to sell. It was a pleasure to work with Mimi, and we were more than satisfied with the result!" - Mr. & Mrs. Rob & Jenn A. "We reached out to you earlier this year, based on the number of listings we saw you were managing. The number of listings convinced us you really would know the area in and around Barrington Hills. And we were 100% right on that. Working with you was so easy, you listened to us, got to know us, and thus were able to help us navigate the options in Barrington Hills, and this was important due to our relocating to the area from out of state. Your first hand knowledge helped make the experience so much simpler. To the extent a potential client was considering you along with another broker, we would simply tell them you were diligent to our needs, paid great attention to what we wanted or did not want, and most importantly, were patient as we went thru the process of buying a home." "We originally contacted Mimi as we knew her in the Barrington community as her son is a very good friend of our son. However, her name is synonymous with the real estate market in Barrington. Our original contact was just to have a preliminary meeting about a year before we were ready to list. She came to the meeting prepared with market data, helped go through our home and make suggestions and set expectations about the real estate market at that period of time. 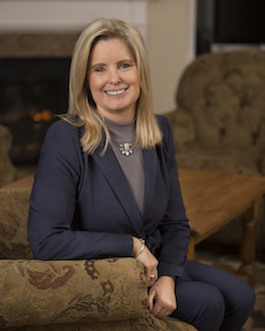 When we were ready, or at least thought we were, about a year later, she worked with us to understand our needs and expectations, was professional and candid about pricing and the most current information about the marketplace and happenings in Barrington. She was attentive, organized and helped us through some emotional moments facing the fact that we had a buyer. She is responsive, provided advice but bottom line willing to do what we felt was best for us, her clients. She met all of our needs." - Mr. & Mrs. Craig & Roslyn M.